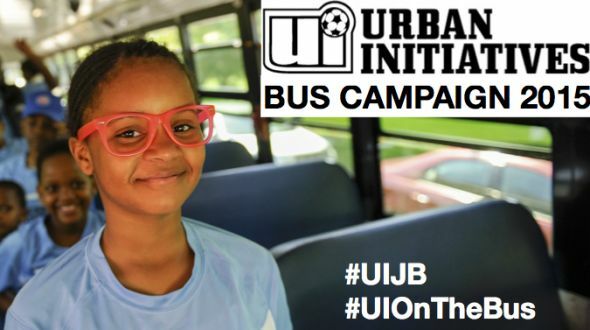 Just over four weeks ago, Urban Initiatives’ Junior Board laid down the gauntlet and committed to raising $25,000 during the 3rd Annual May Bus Campaign. Everyone was excited. The Bus Campaign, a huge show of teamwork and friendly competition, brings groups of Junior Board members together to raise funds in support of game day busing expenses for our 35 Work to Play schools. Each Friday, K-4th grade children on Urban Initiatives teams travel to participate in friendly soccer games against other Urban Initiatives players from schools and communities across the city. In 2013, the Campaign raised $17,714; in 2014, the total was $22,922. This May, our incredible Junior Board went above and beyond our biggest stretch goals by raising $41,421. That’s a lot of bus rides! Check out the Campaign Page. In the Team category, Team Jahn Elementary–Catie Wilber, a Senior Analyst at OMD; Ashley Dobbins, a Media Supervisor at Starcom Mediavest; and Shreya Canakapalli, an Institutional Consultant at DiMeo Schneider & Associates–took first prize for the second time in three years. The trio raised $7,591! Through June 1, month two of Urban Initiatives’ fourth quarter, they have raised $130,496! That’s up from a total of $113,715 last year.We are fortunate to have such an amazing team working on our behalf. A huge thank you to everyone on the Junior Board and to all the supporters who made our success in this year’s Bus Campaign possible!